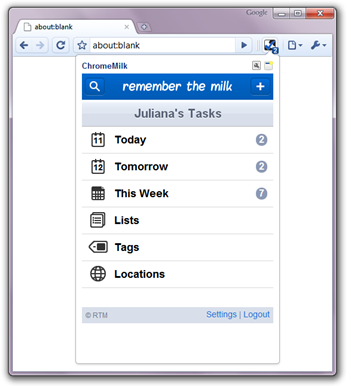 TaskMilk lets you access your Remember the Milk tasks right from your Google Chrome toolbar. TaskMilk is a Google Chrome extension to show Remember the Milk’s Gmail, iGoogle, iPhone or Mobile gadget in a popup when clicked. 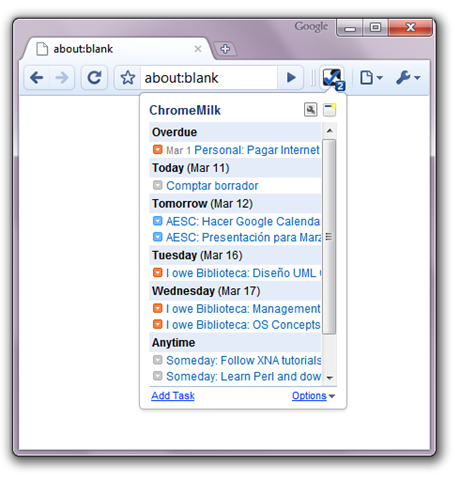 The extension can also show your incomplete tasks in a badge. TaskMilk is available in the Chrome Extensions Gallery. You can also grab the source at the Google Code project page. 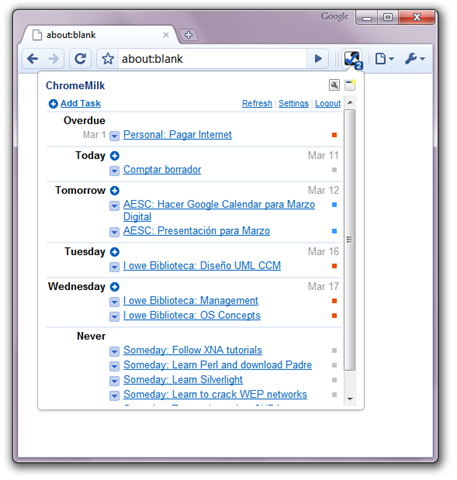 You can look at the list of known issues, report new issues and check on code updates by going to the Google Code project page. This extension is open source under the GPLv2. Icon by Camila González is licensed under a Creative Commons Attribution-Share Alike 3.0 License. If you like this extension, follow me on Twitter and visit my webpage to check my other projects. 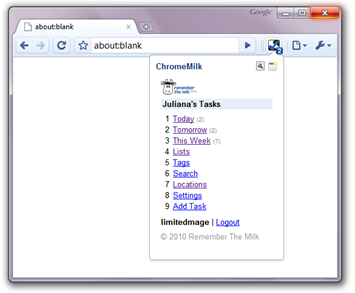 ChromeMilk has been selected by Bestcovery as a Best Pick for the Best Google Chrome Extensions. ChromeMilk has been mentioned as part of Lifehacker’s 18 Extensions Worth Downloading from Google Chrome’s Gallery.